Folate is a group of water-soluble vitamins, generally known as B9. It represents various tetrahydrofolate (THF) derivatives, which naturally occur in foods such as Spinach, Asparagus, Broccoli, Citrus Fruits. Beans, Peas, Lentils, etc. Folic acid is a synthetic compound, which is structurally and functionally very similar to natural folates. However, folic acid undergoes a process of reduction and methylation in order to form active compounds inside the human body. Therefore, its metabolic pathway is slightly different than that of natural folates, which makes their efficiency low. This is the main difference between Folic acid and Folate. Folates are a group of water-soluble, bio-available, natural form of vitamin B9, which was first discovered by Dr. Wills in 1931. At this stage, folate was isolated from yeast, and it was identified as a cure for large cell anemia of pregnancy. In addition to yeast, folates also naturally exist in asparagus, beans, peas, dark green leaves like spinach, collard greens, mustard greens, etc. and citrus fruits like papaya, oranges, grapefruits, strawberries, etc. These cellular folates occur as dihydro- or tetrahydro- derivatives of pteroylglutamic acid. So they are known as dihydrofolates and tetrahydrofolates (THF). However, folic acid does not exist in natural food in a significant extent. Therefore, folate refers to the various tetrahydrofolate derivatives naturally found in food. The Figure 1. Illustrate the basic structure of folate. 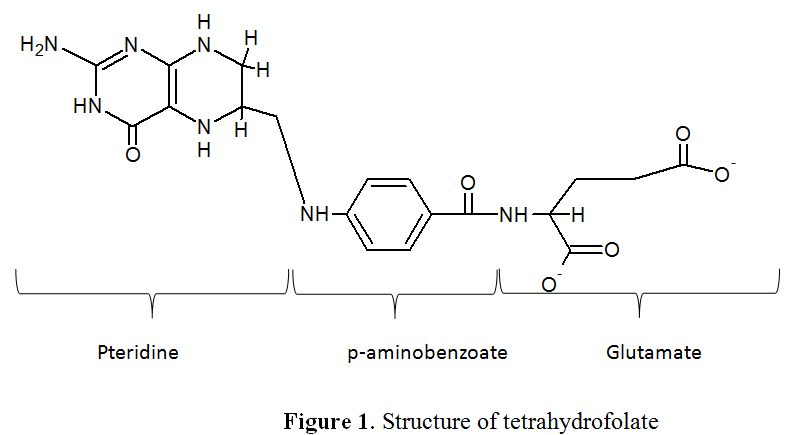 Tetrahydrofolate structure consists of a p-aminobenzoate molecule, which is linked to a pteridine ring and N atom in glutamate. But some other natural folates contain more than one glutamate residues, making them polyglutamate. Folate metabolism starts in the mucosa of the small intestine, and their metabolic pathway and absorption is efficient compared to folic acid. Folates are essential for human cellular growth and regeneration. Mainly it is required for nucleotide biosynthesis in cells, DNA synthesis and repair, red blood cell creation, and prevention of anemia. Folic acid refers to an oxidized synthetic compound that is used in dietary supplements and food fortification. Folic acid was chemically synthesized in 1943 for the first time, and it was introduced as a mandatory food fortification in 1998. This compound is a synthetic form of folate, which is useful to regulate healthy levels by releasing excess through the urine. Folic acid is also known as pteroylglutamic acid. Figure 2. Illustrates the structure of folic acid. Similar to natural folates, this compound also has a p-aminobenzoate molecule, a pteridine ring, and a glutamate residue, but it is an oxidized compound than tetrahydrofolate (THF). THF is the only form of folate that has the ability to enter into the natural folate metabolic cycle. Therefore, folic acid initially undergoes reduction and methylation in the liver in order to form THF using dihydrofolate reductase enzyme. The low activity of this enzyme in the liver, encourage high intake of folic acid, and ultimately it leads to increase the unmetabolized folic acid circulation inside the body. Therefore, this process is slow and inefficient compared to natural folate metabolism. Folate naturally exists in Spinach, Asparagus, Broccoli, Citrus Fruits. Beans, Peas, and Lentils. Folic acid is a synthetic compound, which is included in fortified food to fulfill vitamin B9 requirement. Folate is a Dihydro- or tetrahydro- derivative of pteroylglutamic acid. Folic acid is a pteroylglutamic acid. Folate is a reduced form of a molecule. Folic acid is an oxidized form of a molecule. Folate can directly enter to the metabolic cycle. Therefore, metabolism starts at the mucosa of the small intestine. Folic acid should be converted into THF before entering to the metabolic pathway. Therefore, folic acid initially undergoes reduction and methylation in the liver in order to form THF using dihydrofolate reductase enzyme. Folate has a high absorption efficiency. Folic acid activation is slowed by the low activity of the dihydrofolate reductase enzyme. Folate poses no health risks. Unmetabolized Folic acid increases the cancer risk and undetected vitamin B12 deficiency. Folate rapidly loses activity over periods of days and weeks, and also there is a significant loss of biochemical activity during harvesting, storage, processing, and preparation. Folic acid is almost completely stable for months or even years because oxidized form of Pteridine ring is very stable. It requires dihydrofolate reductase enzyme to form active vitamin B9.